K-2 BRIDGE is an option for K-1 or K-2 multi-grade teachers trying to teach Pathways 1-2 and the new Kindergarten Stepping Stones. Both can be accomplished by teaching one core book using one Daily Lesson Guide. All targeted skills for K-2 are included in one document! Additionally, a character-building concept and celebration of learning has been added to each unit. Theme 0 – Off We Go! Theme 6 – Brrrr! It’s Cold! 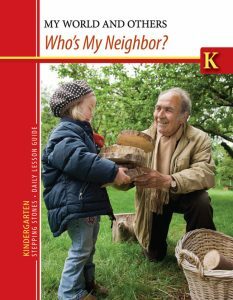 Theme 2 – Who’s My Neighbor?